NeMe invites you to a talk by James Bridle based on his ongoing research, Unbuilding Citizenship, at the NeMe Arts Centre on Saturday 2 December, 2017, 8pm. James Bridle’s work explores the implications of technological acceleration and opacity for everyday life. His project Citizen Ex examined what your citizenship might look like if it was determined by your online behaviour rather than your passport. Are digital citizens more free or more restricted? Who decides who gets to go where, and how? Information flows at the speed of light around the globe, but people are still subject to the restrictions and violence of borders. Can the ideas of digital identity be applied to the postnational, postgeographical age we are entering into? In his talk, Bridle will discuss the implications of algorithmic citizenship, deterritorialised nations and digital governments. James Bridle is a British artist and writer living in Athens, Greece. His artworks and installations have been exhibited in Europe, North and South America, Asia and Australia, and have been viewed by hundreds of thousands visitors online. He has been commissioned by organisations including the Victoria & Albert Museum, the Barbican, Artangel, the Oslo Architecture Triennale, the Istanbul Design Biennial, and been honoured by Ars Electronica, the Japan Media Arts Festival, and the Design Museum, London. His writing on literature, culture and networks has appeared in magazines and newspapers including Frieze, Wired, Domus, Cabinet, the Atlantic, the New Statesman, and many others, in print and online, and he has written a regular column for the Observer. 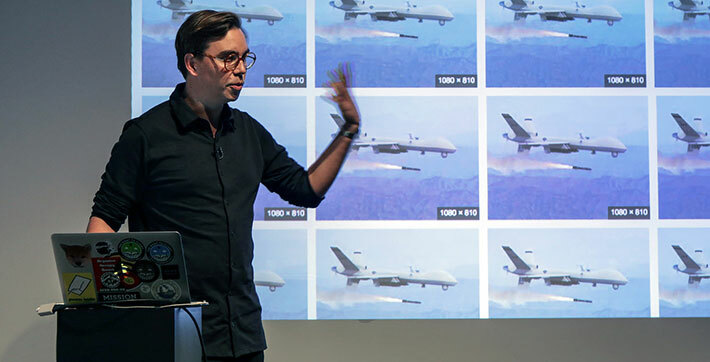 His formulation of the New Aesthetic research project has spurred debate and creative work across multiple disciplines, and continues to inspire critical and artistic responses. He lectures regularly on radio, at conferences, universities, and other events, including SXSW, Lift, the Global Art Forum, Re:Publica and TED. He was been a resident at Lighthouse, Brighton, the White Building, London, and Eyebeam, New York, and an Adjunct Professor on the Interactive Telecommunications Programme at New York University. His work can be found at jamesbridle.com.